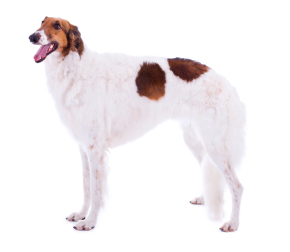 Learn about the temperament and personality of the Borzoi. Discover what he's like to live with, his traits and characteristics and how he generally behaves. And look at lots of Borzoi photos. The Borzoi is an athletic, agile, and affectionate breed, famous for their intelligence and independence. They are large, strong, and fast, so early obedience training is recommended. These are smart dogs but they are stubborn and very slow to learn your commands. They are however, quick to housetrain. Borzois do well with children when they are raised with them, but most Borzois will not tolerate rough treatment from a child. It is also important to remember that this is a large dog who can accidentally knock over and injure a small child during play. They usually do well with other pets in the household, but male Borzois can be aggressive with other male dogs. The Borzoi is a sight hound and he loves to run, and he loves to chase. Just because he loves your cat doesn't mean he won't chase the neighbor's cat across town. It is crucial to keep a Borzoi on a leash or in a fenced area at all times, because he will chase anything that moves. And if he gets away from you, you will never catch him. These dogs need daily exercise and love to run and go for long walks. They love spending time outside with their family. These are affectionate dogs, but are not as demonstrative and needy as some breeds. They can be aloof, especially around new people. They are very quiet dogs and rarely bark, so don't make very good watchdogs. They are generally well behaved, but behave like puppies for a long time. If a Borzoi gets destructive, it is probably because he's bored. Borzoi are noble, proud, and dignified. They are gentle, loyal, loving, and will want to sleep in your bed! The Borzoi is the hardest to train of all dog breeds. He learns new commands slower than all other breeds. You will need to be extra patient when Training him. The Borzoi sheds a fair amount of hair. You'll find hair stuck to your couch, carpets, clothes and everything else in your home.